As veterinary specialists, we’ve seen a lot of unique and interesting cases. We are often asked what the craziest thing we’ve ever seen is, and in many cases, these “crazy” stories center around the holidays. Unfortunately, the holiday season holds many hazardous situations for our furry family members. One of our surgeons, for example, had a patient once eat a carving knife off of the Christmas table! Most cases aren’t quite that extreme, thank goodness, but they can be just as serious. An example of a more common holiday emergency would be a pet (we’re looking at you, dogs!) who either steals part of the holiday dinner or is fed table scraps. Many people don’t realize that there are several emergency situations that could arise from eating the rich “people food” we serve around the holiday season. Pets can develop gastroenteritis, pancreatitis, food bloat, or have complications ingesting bones. Gastroenteritis simply means inflammation of the stomach or intestines. In most cases, signs are limited to vomiting or diarrhea for a short period of time. However, some dogs get quite sick and need medical attention. Pancreatitis (inflammation of the pancreas), however, is a much more serious condition that can be fatal if not treated promptly. Dogs with this condition are sicker than a dog with gastroenteritis. Symptoms can include severe vomiting, abdominal pain, lethargy, anorexia, diarrhea, fever, increased heart rate, and labored breathing. It’s very important for your pet to be evaluated by a veterinarian as soon as possible if they begin to exhibit these signs during the holiday season. Remember to tell your veterinarian if your pet was fed or got into something they shouldn’t have! Food bloat occurs when a dog eats or drinks a large volume too quickly and the stomach distends to an abnormally large size. If you notice your dog has a very large painful stomach, discomfort laying down, restlessness, or retching without producing anything, emergency treatment should be sought immediately. A bloated stomach can become serious–even deadly–very quickly! A dog eating a bone may not sound like it would necessitate an emergency vet visit–after all, dogs have been chewing on bones for thousands of years, right? Unfortunately, in some cases ingesting a bone leads to an emergency situation. Dogs can get sick when the bone irritates the gastrointestinal tract with the sharp bony material. Bones can also fail to digest and cause an obstruction if they are simply too large. Vomiting, poor appetite, nausea, and discomfort are important signs to look out for with this one. Ingesting holiday decorations can lead to gastrointestinal blockage–a condition that requires emergency surgery. 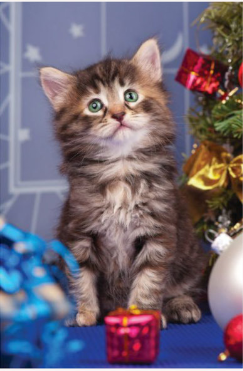 Cats in particular LOVE to play with, chew on, and eat many of our holiday decorations, such as tinsel, beads, ornament hooks, plants (Poinsettias are toxic! ), and even a Christmas tree itself. These foreign objects can form a blockage in the gastrointestinal (GI) tract, which can be a life-threatening condition. Symptoms of a GI blockage can include lethargy, poor appetite, and vomiting. During the holiday season, take extra precaution with your four-legged family members to try to prevent emergency situations wherever possible, and remember that if an emergency does happen, Gulf Veterinary Specialists is available 24/7 at 3800 Southwest Freeway or at 713-693-1111.